We Vraj Engineers & Consultants Private Limited was established in the year 2002. Mr. Sharad S. Parte is a man that many believe is a born visionary. It was this inborn instinct coupled with a desire to move beyond the ordinary that led to the formation of VECPL at the turn of the 21st century. Today, the company name introduces itself. Such is the success of this engineering giant that specializes in manufacturing continuous casting machines and other steel plant equipments, paving the way to endless possibilities for the steel industry. Over the years, the company has, through their perseverance to master all service, added expertise and also offer design and engineering consultancy services for building mini steel plants consisting of Induction, LRF, AOD and CCM. Their successful actions in pushing the envelope towards greater success has earned the company appreciation for its dedication and teamwork. It hardly comes as a surprise considering VECPLs focused goal of delivering the best in terms of quality and service that simply delight every customer sense. 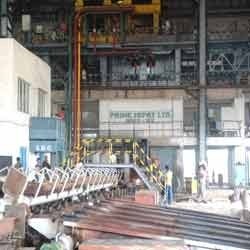 With the headquarters based in Navi Mumbai at Airoli and its works at Ambernath MIDC, Maharashtra, VECPL has a complete design office set up & large fabrication shop that also houses a net work with local representative and machine builders in different steel plant equipments for the steel industry. VECPL A company that continues casting the die that rolls onto quantity every single time.